See why this is Yoga Direct’s best-selling yoga mat bag! Our Nylon Zippered Yoga Mat Bag is the perfect size for storing a standard-size 1/4” yoga mat. This stylish yoga mat bag features an adjustable strap and zipper closure. Plus, the mesh window allows your yoga mat to dry off after leaving the studio. Six bold color options to choose from. If you are looking for a similar yoga mat bag in a larger size, view our Oversized Drawstring Yoga Mat Bag. This item is available in custom printing if you are looking to add your yoga studio name or logo. A stylish and economical way for your clients to tote their yoga mats to and from class is the Zippered Yoga Mat Bag. 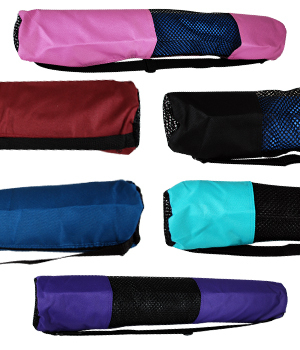 Our Zippered Yoga Mat Bags come in a variety of great colors, and are comfortable to carry. Made of a lightweight material including a netted mesh area, these bags allow mats to breathe and dry. The bag has a zippered closure and an adjustable shoulder strap. Each yoga mat bag is available to be custom printed with your company or studio logo or design. You may also have your studio or company's name embroidered on the bag. I purchased several yoga mat bags from YogaDirect some years ago. This is one of them. I teach a variety of group fitness classes, including Yoga and Pilates, and like to carry a different mat (in a different bag) for each type of class. This one fits my green 1/8-inch, extra long travel mat nicely. I needed a very simple mat bag so as not to dirty my mat when I keep it in my yoga studio. This is great and I like that it has vents. Color options make the mat easy to find in my studio storage. Zippered Yoga Mat Bag arrived on time, along with my new mat. Bag fits my new mat great. This is not the most fancy bag in the world. Does it work: yes. Are there plenty of color options: heck yes. Is the price right: YES YES YES. I like to give these to students when they buy a mat from me. Definitely cost effective. This item is too small for a 1/4 inch yoga mat. The struggle to remove or insert the mat into the bag is not worth the stuggle. Take your 1/4" mat along for a pose! This mat seems a bit to short to easily fit your mat into it. We couldn't fit my rubber mat in it, and it's a close fit for my other regular yoga mat. It needs to be about 3 inches longer to not have to wrestle your mat into the bag. The straps are a bit too close to the zipper to open the zipper easily.